At the 2009 Rock around the jukebox show in Rosmalen, Netherlands, Henk de Jager showed his latest creation: Merlins Magic. 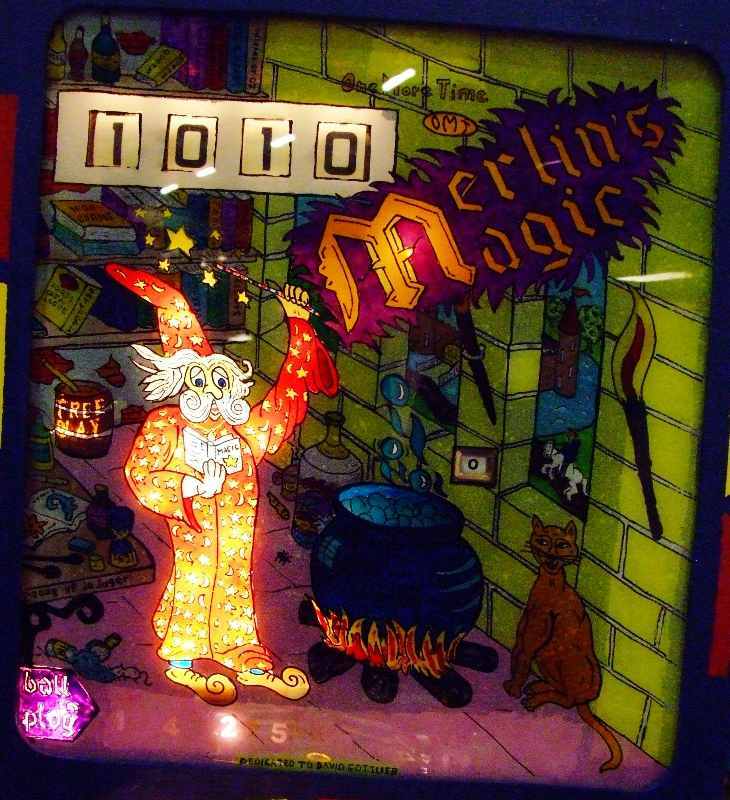 Merlins Magic is a unique pinball machine, Henk made it totally by himself. The design, woodwork, electrics, assembly, artwork, .. everything is the work of 1 person. 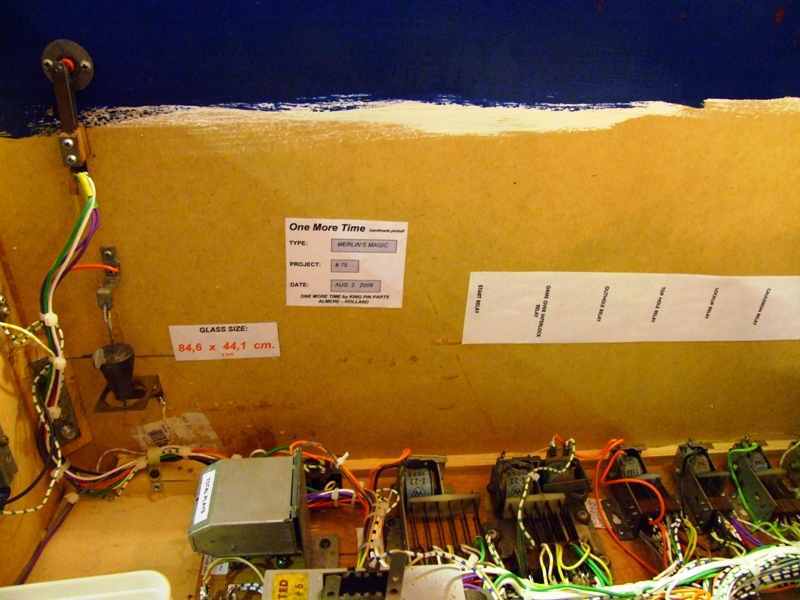 It's not Henks first custom pinball machine, each time they become more and more complicated. 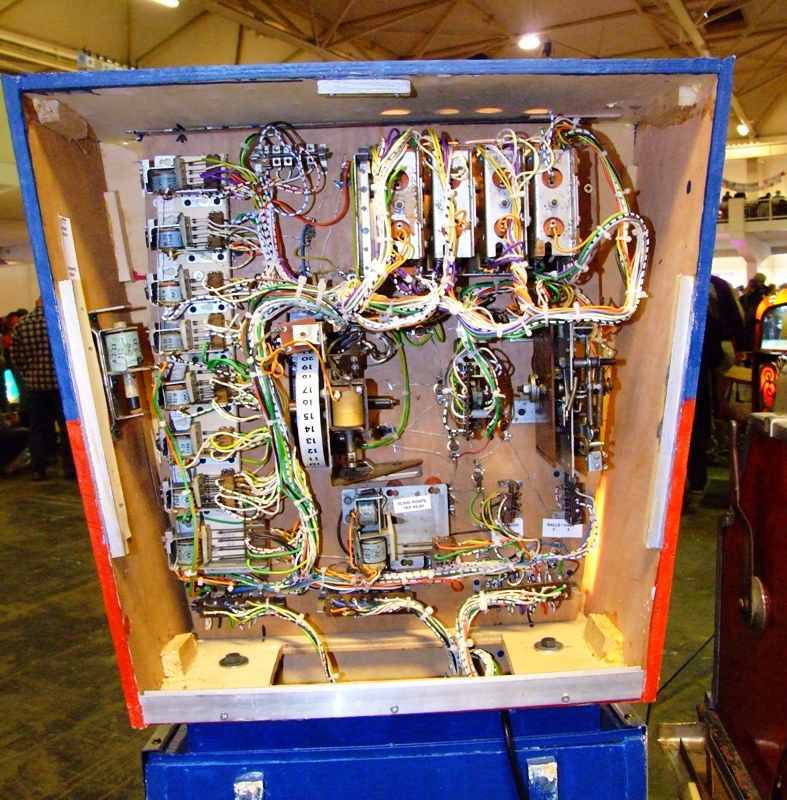 An overview of the playfield. Doesn't look too special you say ? Well, actually it is ! As always Henk has done his best to make his custom games unique and include special features. 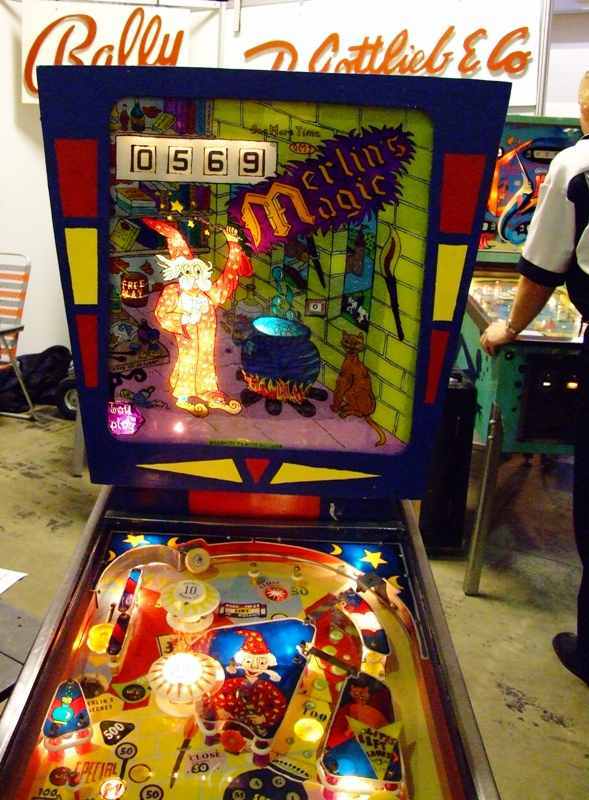 Merlins Magic has no less than five 'industry firsts' for (an electro-mechanical) game. Some of the rules already: at the bottom left there's a string of lights that each light on turn. They score 30, 50, 300 or 500 points. Each of the 50 points also adds a MAGIC letter. Complete Magic to earn an extra ball. This also lights the left saucer for '500 points scores Magic Match'. 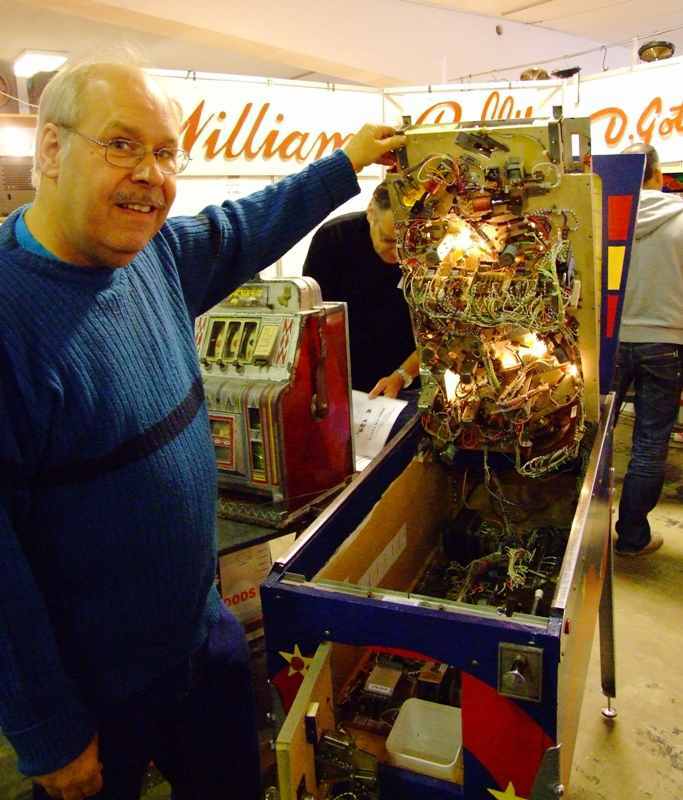 Henk showing the bottom side of the playfield. 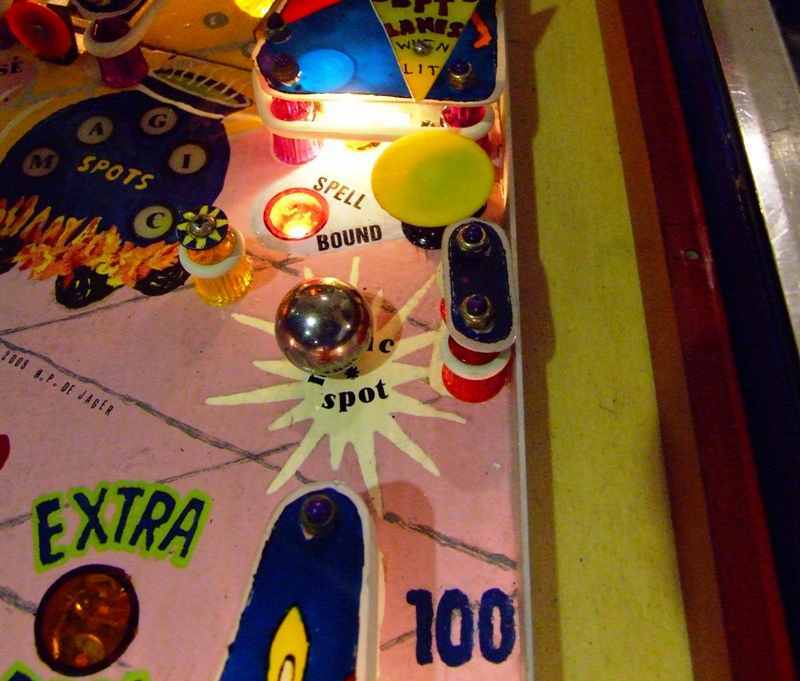 When the pinball goes into the lane at the far left side of the playfield, an up-post comes up and stops the ball. All lights on the playfield dim. This post has been used on other games but always between the flippers, not somewhere else on the playfield. It is also player-controlled. 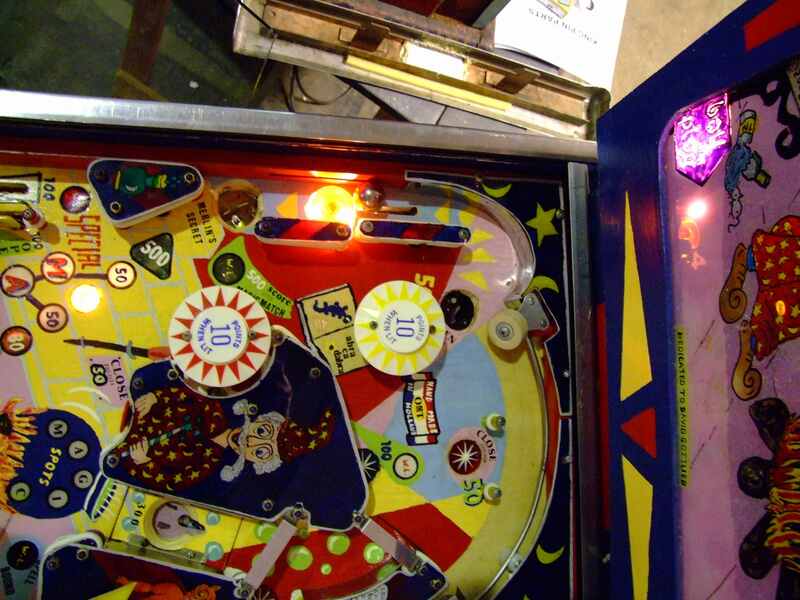 Press left flipper button to control when the post goes down to release the pinball. This way the player can try to time what score he gets from the 'Merlin's secret' saucer. Its value depends on the lit light in the row below. Industry first number two: 'Magic Match'. This gets activated when the player is able to score 500 points in Merlins Secret saucer. Magic Match means that the player is guaranteed to get a match ! At the end of the game, when Magic Match is lit, the game will continue the match sequence until the match number is correct. If the number is not correct, the lights underneath the cauldron light and the match sequence starts over again. As a match has ten possible choices, on average the match sequence repeats itself five times. Dedicated to David Gottlieb. Also notice the order of the ball in play. Another industry first: a magnet on an e-m game. When 'spellbound' is lit, a hit to the yellow bumper activates the magnet underneath 'magic spot'. This scores somewhere between 250 and 2550 points. The Magic Claudron. At the right of the playfield is a lane with a star rollover which scores 100 points. When the 'open' target on the playfield is hit, something special happens..
..the star rollover suddenly disappears and a saucer appears ! 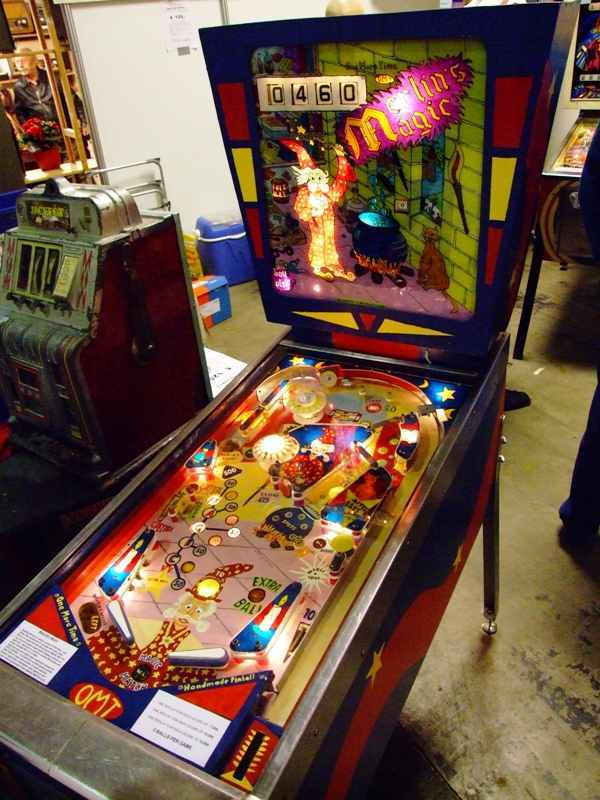 If you shoot the pinball in this saucer you get 300 points and a 'magic' letter. 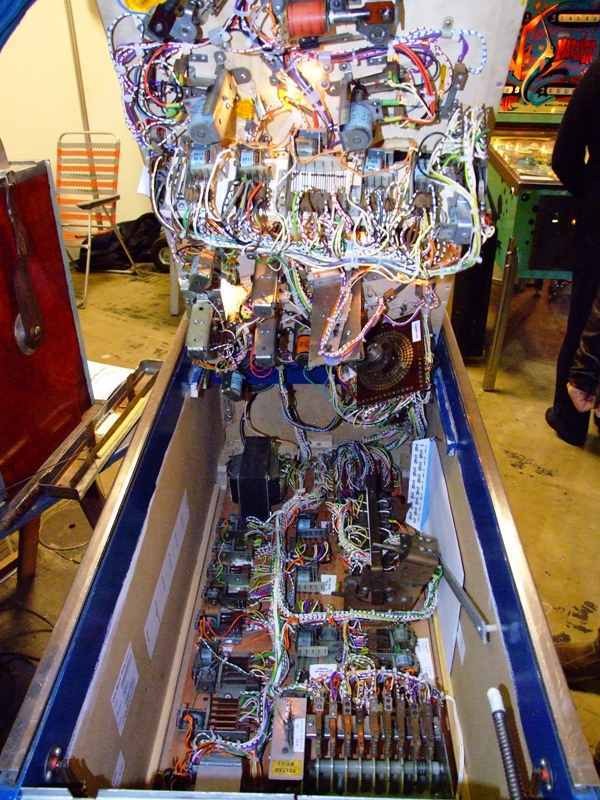 To move the playfield, a special mechanism has been created which uses a pinball machine score motor. Also notice both gates at the top of this lane. Through this lane it's possible to shoot the pinball back towards the top of the playfield. If the ball only makes it halfway it will return to the shooter lane, and 'spellbound' is lit. The last industry first is a double special. If MAGIC is completely lit and the yellow bumper is hit, Special will light. If the ball leaves the playfield at the bottom you get a free play, if the pinball leaves by the outlanes you get two free plays..
Henk explained to me some changes he made to the layout. 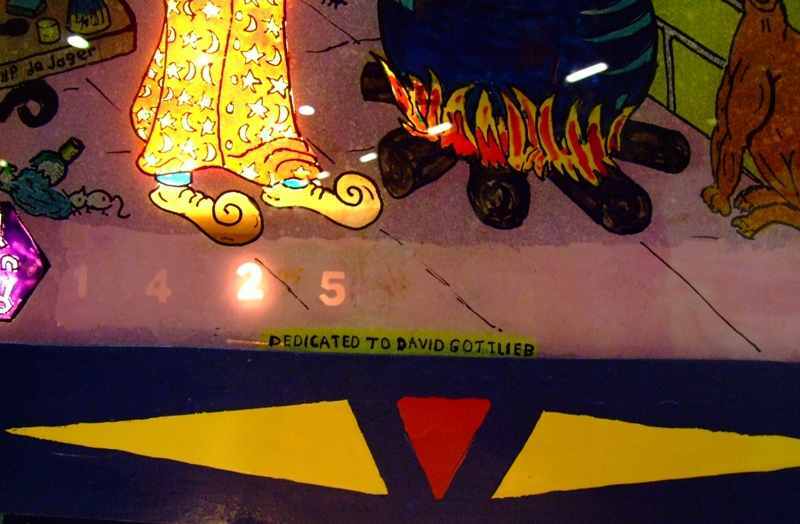 When he had designed the playfield, he thought the upper popbumper would bounce the pinball often into the far left lane (with up-post). As this only happened rarely, he added a saucer above this popbumper that ejects the pinball into this lane. 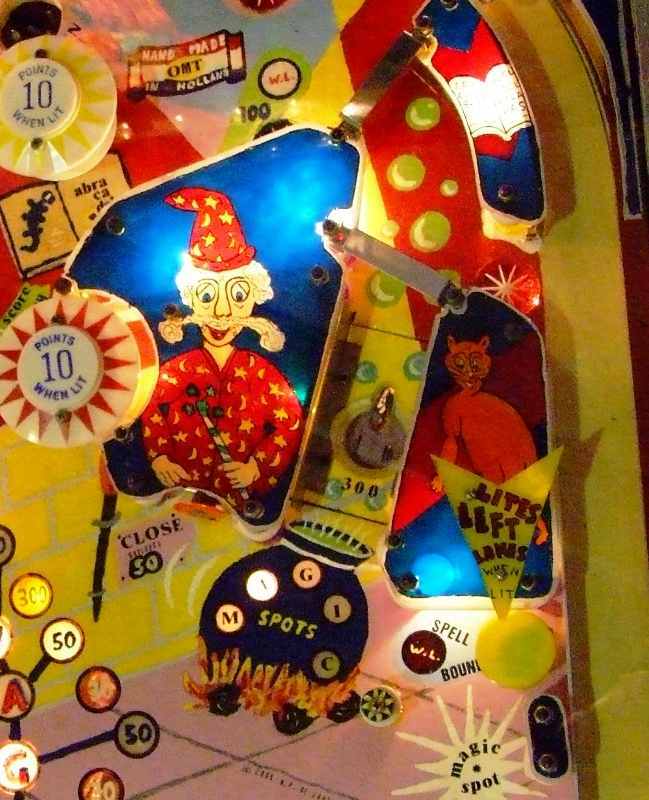 He also added a small post near the yellow bumper on the bottom right, so the magnet would always catch the pinball. Because of the large plastic (to hide the moving playfield), there's an important division between the upper and lower playfield. Under this plastic (under Merlins hat) there's a slingshot kicker which will hit the ball towards the top of the playfield, together with the bumper on the left this results in a lot of action ! 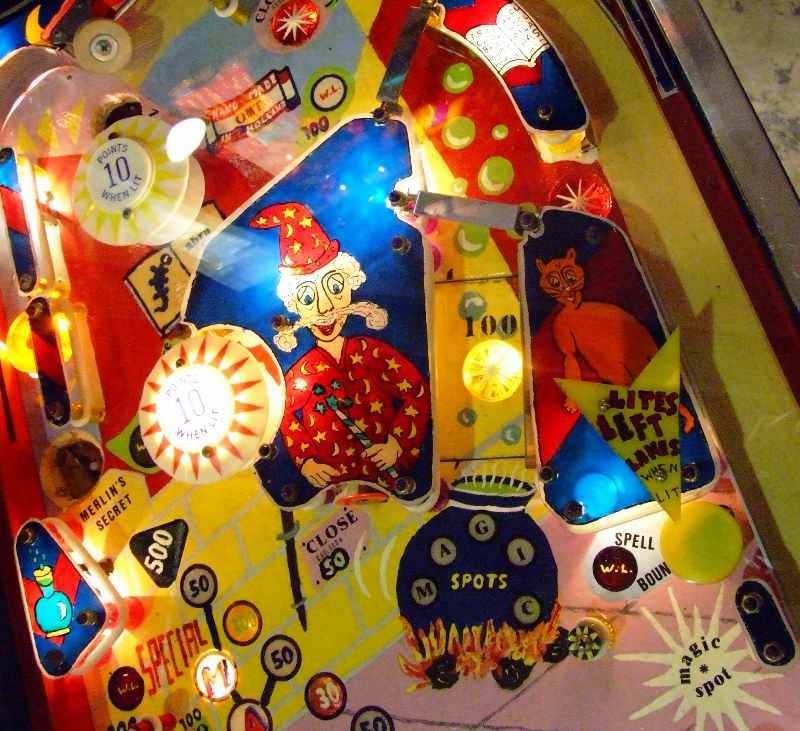 A pinball can really stay a long time at the top of the playfield. 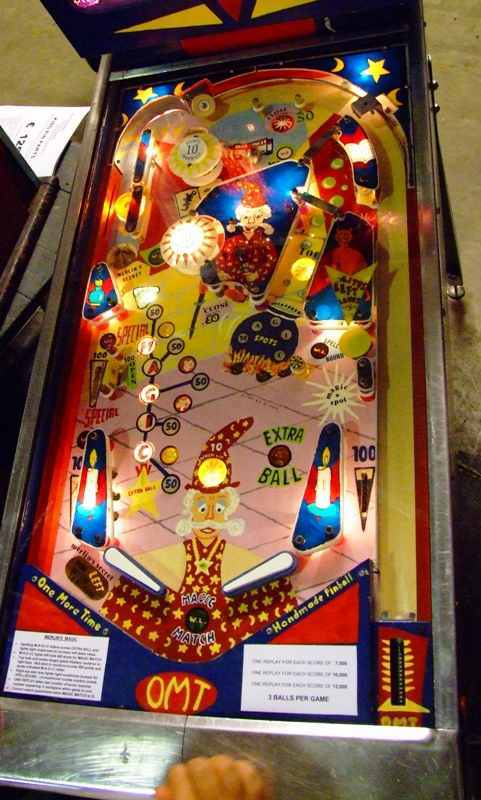 When the ball finally reaches the lower half of the playfield, it's quite difficult for a player to flip the ball back onto the upper part of the playfield.